NOTE: Over the past few years a series of powerful storms have moved, rearranged or wiped out some of the popular fishing holes or pools along the Salmon River. Also, the purchase of river property has, in some cases, eliminated or restricted access to public water. 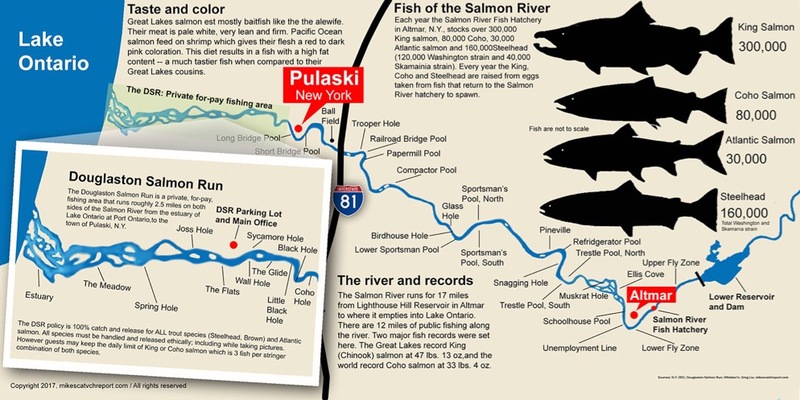 For current Salmon River updates, always check with local fishing or fly fishing shops in and around Pulaski or Altmar, and information on the New York Department of Environmental Conservation for news about fishing conditions on the Salmon River. For conditions on water flow go to the U.S. Geological Survey water data website for the Salmon River at Pineville.